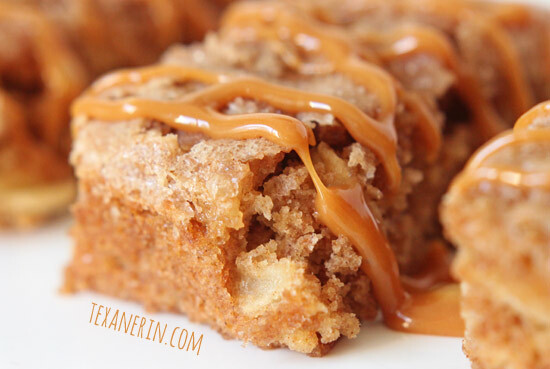 These apple cake bars are super moist and full of cinnamon apple goodness! I didn’t expect much of these, so it was a big surprise when these turned out to be the best result of my baking weekend. I cut them up as bars but what these reallyare is questionable. Apple blondies? Apple cake? Apple squares? I don’t know what to call them. I just know that they’re ridiculously tasty! These apple cake bars were like cake. Not a light and super fluffy cake, but delicious cake. And on the second day, these are like super moist cake. I’m not sure what’s up with that. These would also be fantastic with some dulce de leche on top. I didn’t feel like using an entire can, so I used melted caramels mixed with a little milk. But like I said, it’s really unnecessary. They’re also pretty quick and easy to make. I used olive oil (canola oil would be okay, too) and so there’s no butter or anything that needs creaming. Just mix it all together with a big spoon. Simple stuff! Preheat your oven to 350°F (175°C). Grease an 8″ x 8″ pan or line it with parchment paper. In a small bowl, mix together the flour, cinnamon, baking powder and salt. In a large bowl, mix together the honey, olive oil, and sugar. Add the dry mix to the wet mix, stirring just until combined. It will be very thick! Add the apples and stir, just until combined. Spread the mixture evenly in the pan. Mix together the sugar and cinnamon for the topping and sprinkle over the batter. Bake for 15 – 20 minutes or until a toothpick inserted in the middle comes out clean. Then smother it with caramel and do a little dance. The first time I made this, I made it with 2/3 cup unrefined sugar and no honey. This was also excellent, so make it however you prefer. 30 comments on “Apple Cake Bars (100% whole grain)” — Add one! I followed the recipe to every detail, except the fact that I used a combination of maple syrup and brown sugar. I used pacific rose apples. It turned out as the best cake I ever baked. It’s incredibly soft, moist and perfectly sweet. It was that irrestible we finished a loaf in two days. Hi. Do you calorie information on these Apple cake bars? I love the fact that I do not have to use almond flour in these. It is all made with stuff I already have except the apples. Thank you for making healthier eating so affordable. Now I just have to go through the thousands of recipes I have on Pinterest and Yummly and see which ones can be modified and which ones need to go; no matter how yummy they look. I made this a couple days ago and it was just amazing.seriously awsome!I made them in 9 inch pan(cause I don’t have 8 inch)and they become a little thin.but taste is what matters and it was great. These turned out wonderful! I topped with apple slices and a honey glaze, and they’re a perfect treat for the Jewish new year. I did a second batch and doubled everything for a 9×13 pan, and those came out perfectly. My husband (as usual with your recipes) had no idea it was whole grain. I was Pinteresting for apple-and-honey recipes to make for Rosh Hashanah, and these caught my eye before I even realized it was your recipe! I’d love to make them–any suggestions about how to get some honey in there? I apparently have forgotten how to read. Now accepting donations for Hooked on Phonics. These look yummy. 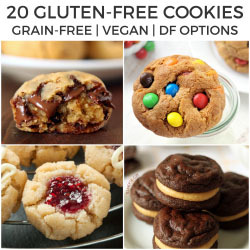 Could they be made with coconut oil and a gluten free flour blend? Thanks. I haven’t tried using a GF flour blend here so I can’t say for sure. Coconut oil should work, though! But you could check out these grain-free apple pie bars. :) They’re super yummy! How about using two egg whites then? :) The texture might be different but I don't think it'd affect it too much! Oh no! I'm too late for my suggestion…but according to David Lebovitz, French butter (both salted and unsalted) is unparalleled! He raves about Pascal Beillevaire butter on his blog. I didn't try it when I was in France because I didn't want to buy a whole stick for the short amount of time I was going to be there but I can only imagine how awesome it would be to bake with it!! 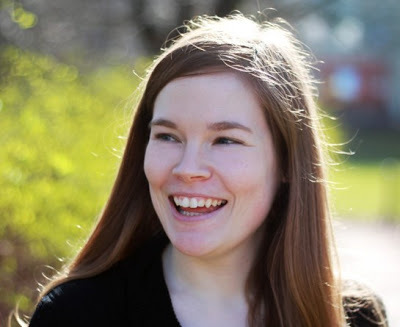 Love your blog btw. Oh boy, those look great. I love that you used whole wheat flour and honey! Sorry for the slow response – I haven't had internet access since I submitted this post. warmvanillasugar – Thanks! I think half and half is a good way to go until you're used to it. I gave some of these to my parents and they didn't realize that they were whole grain (and they NEVER eat anything whole grain). brandi – Thanks! Me too. It's somehow become even more fun than normal unhealthy baking. It's now like a fun game, trying to make healthier things taste unhealthy. these sound so delicious! i love baking with whole grains. I just love your site! Love the whole grain cooking ideas/recipes and I'm looking forward to making items that you post. Great photos too! You are extremely lucky…I only wish I was going to Swiss and French markets to buy supplies :-(? 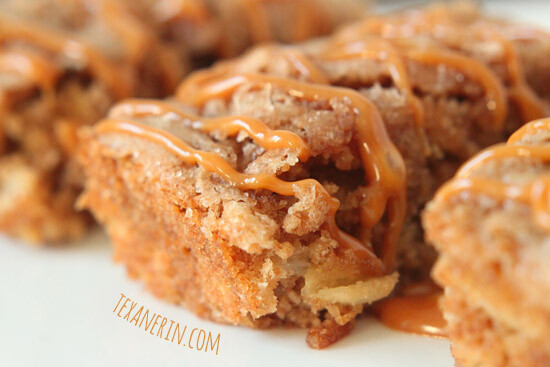 Enjoy my friend….these squares look yummy and with that caramel sauce…..welll not comment :-) I am still to find the maple extract to make the cookies…..will keep searching! These squares are lovely! I really want to try this whole grain baking thing. I've been doing half and half recently and need to go the whole way!